Outskirts Press is the vanity press I love to hate. I urge writers to stay away from Outskirts because its people are inept and dishonest, but those same characteristics give me lots to write about. Outskirts management and staff are like The Gang That Couldn't Shoot Straight. When they try to draw guns, they shoot themselves in the feet. When they try to instruct and advise, they reveal how little they know. When they try to be competitive, they create opportunities for their competitors. 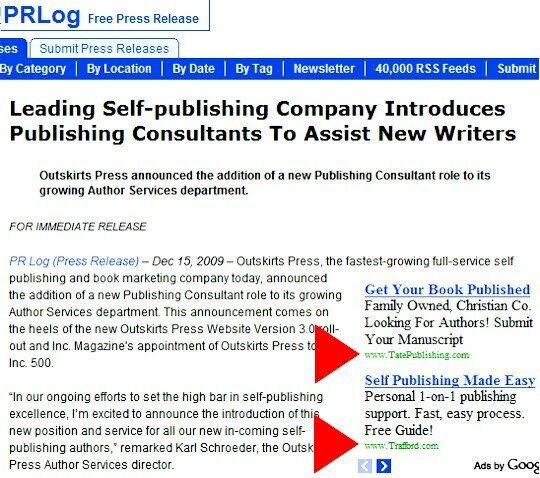 Outskirts frequently sends out press releases promoting their author-customers, and tooting their own horn. Rather than spend money with first-class news distribution services like PR Web, PR Newswire or Business Wire, Outskirts instead does it the cheap way, with no-cost news services like PR Log, PR.com, Newswire Today and Free-Press-Release.com. The freebie services generally get little attention from media. When I checked, I saw that a release for an Outskirts book, Eternal Life, was not picked up by EVEN ONE website. The services that Outskirts uses often present ADVERTISING FOR COMPETITORS of Outskirts -- on the same web page! Was Outskirts too lazy to check, too blind to see, or too stupid to care? Up above you can see some alleged news about Outskirts that was distributed at no charge by PR Log. Since Outskirts doesn't pay PR Log, PR Log must get income from somewhere. They carry pay-per-click ads that target key words in the press releases. So, the Outskirts news that is intended to get customers for Outskirts, runs right alongside vanity press ads for Tate, Trafford, CreateSpace, Lulu, iUniverse, Dorrance, AuthorHouse and perhaps others. Those companies are paying money to grab potential customers away from Outskirts, which was unwilling to pay a few hundred bucks for news distribution free of promos for its competitors. Outskirts Press is cheap, stupid, ignorant, deceptive and self-defeating. It's OK to use the company for laughs, but not for publishing. Very revealing and funny, as usual, Michael. Every potential customer of Outskirts should read this blog. Michael, if you keep pointing out how bad Outskirts is, you may drive them out of business and then you won't be able to write about them. You could be killing the goose that lays the golden eggs.